To test the idea, they gave seven volunteers a novel to read in which certain letters were always written in red, green, blue or orange (see picture). Before and after reading the book, the volunteers took a “synaesthetic crowding” test, in which they identified the middle letter of a grid of black letters which were quickly flashed onto a screen. 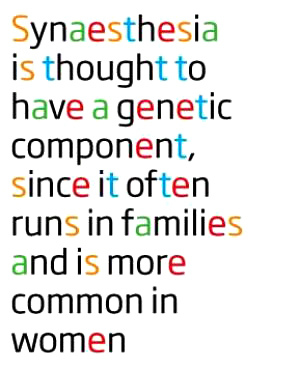 Synaesthetes perform better on the test when a letter they experience in colour is the target letter. The volunteers performed significantly better on this test after training compared with people who read the novel in black and white. Update: You can read a more detailed abstract of Colizoli’s experiment over at synesthesia.info. Previous PostSo many colors, so few of them right.Next PostA Happy Accident.